Today I got inspired to take the Kayak out for some time on the water. I appreciate the light weight and portability of this water craft. 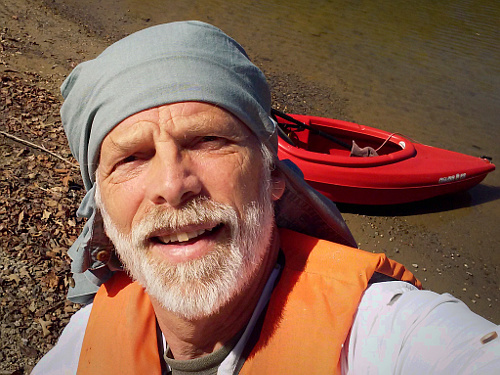 My last trip earlier this year was floating down a river (see Expanding My Kayak Experience) and the time before that was spent on a private pond while I got initially acquainted with kayak operation. Now I wanted to expand my horizons and travel on a larger body of water and chose W. Kerr Scott Dam & Reservoir here in Wilkes County NC. In my excitement to get on the water I forgot to pack two important items: drinking water, and my hat! I only planned to spend a couple of hours in the kayak so I knew that the lack of drinking water would only be an inconvenience but not having a hat meant the possibility of a sunburn that I didn’t want. I decided to improvise. I had a second shirt available so I twirled the cloth around the outstretched arms then placed the roll on my forehead, tied the sleeves behind my neck, then pulled the remaining cloth over my head and tucked it under the sleeves. It made a nice dew-rag with plenty of cloth to cover my neck, protecting me from the sun. Not being on the river meant that I had to paddle everywhere. It was a beautiful Autumn day so I wasn’t in a rush to get anywhere but took time to explore the shoreline in a number of inlets. I didn’t take fishing gear as I hadn’t purchased a fishing license but there were fish jumping in the water and I knew that this might be a future destination. I spotted a deer in the woods and we eyed each other for quite a while. I saw birds of prey soaring, crows cawing, heard woodpeckers chipping, and a great blue heron took flight low to the water as if staying under the radar. I enjoyed the time alone in solitude to drink in the beauty, but truth be told, I prefer sharing the company of a friend. Of course that also provides better safety. Hopefully while the weather is still decent, I would like to do an overnight trip so I will be shopping for a dry bag for my camping gear. I think that any leisure time on the water is a great reward for your effort and if you haven’t tried a kayak yet I recommend it. This entry was tagged Boating, Dew-Rag, Improvise, Kayak, Reservoir. Bookmark the permalink.